Wasteland 2018 is at our home in the Mojave, with much larger camping areas, room to expand, and new areas to explore. Don’t know where you’re camping yet? Want to meet up with your friends and create a new tribe? Going for the first time and have absolutely no clue how any of this work? 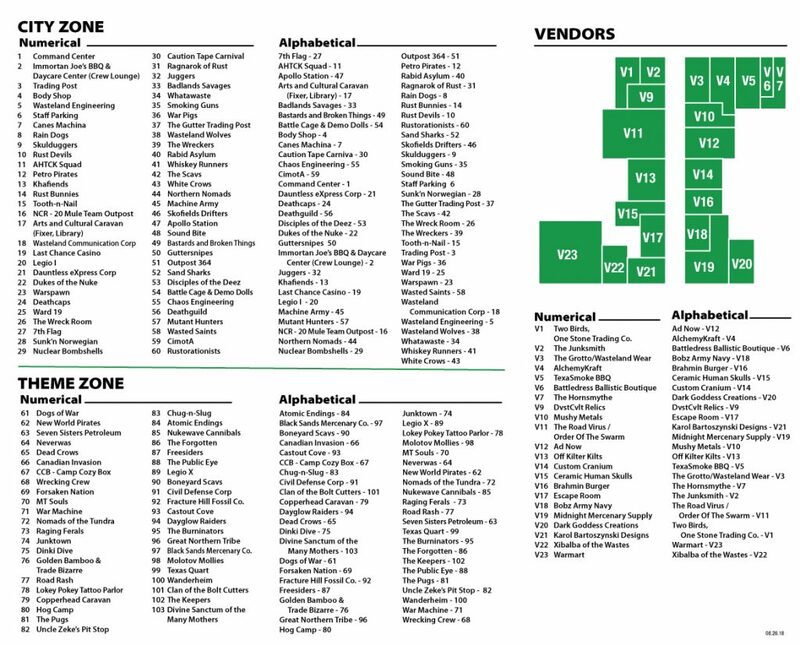 Check out the 2018 layout! New camping zones have been added for 2018 expanding theme-optional areas where Wastelanders with like-minded views, designs, and costumes can come together. Totally into the post-nuclear vision of apocalypse? Want to camp with similar styled Wastelanders? Now is your chance! Fresh out of a vault, or roaming the Mojave in Fallout style? There’s a new settlement just for you. Whether you are part of an organized tribe, or just costumed out for the viral apocalypse, there’s a gathering of Wastelanders out there to unite with. Wasteland City is the hub for barter/trade, operations, entertainment, and home to a select few elite tribes. Wasteland City is 100% themed. Placement within the city is determined ahead of time through tribe/vendor applications. Those groups with a proven history of bringing something special to the event will have the chance reserve their spot inside the gates. Reserved camping for fully themed camps extends out beyond the walls of Wasteland City into the Theme Zone. On the outskirts of Wasteland City is the great gathering of tribes. 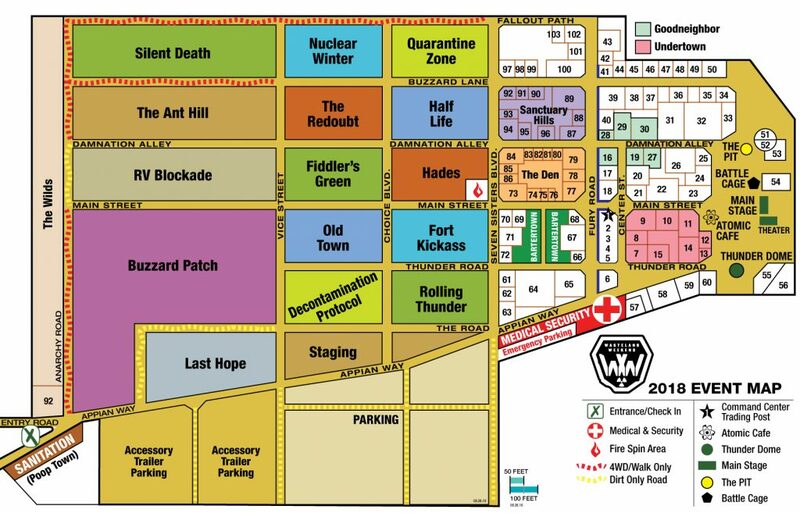 While all of Wasteland is on shaky neutral ground, similar themed camps can band together in loosely designated zones. Theme camping is suggested, but not required. Camping is on a first-come, first-serve basis. 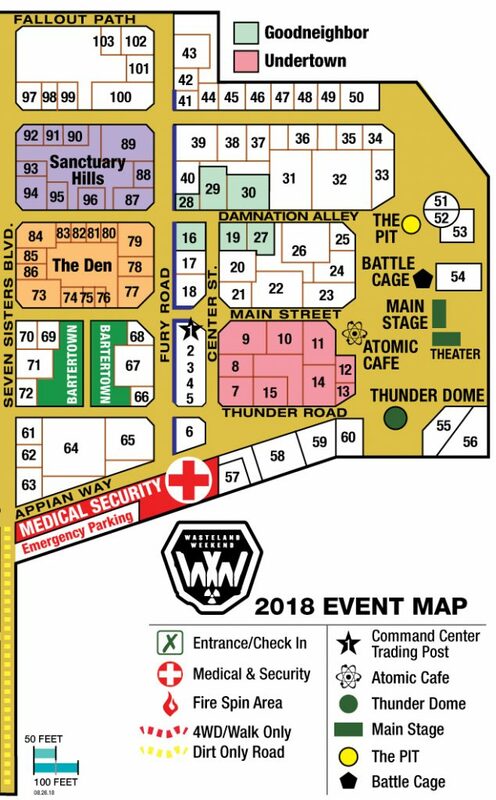 The map is a rough layout for Wasteland 2018. Like everything in the post-apocalyptic future, there’s bound to be some chaos involved, and no plan ever survives contact with cannibals, marauders, or the Lord Humungus. Expect to see revisions during the countdown to Wasteland 2018, but for now, get planning! Decontamination Protocol – Just escaped the city and barely survived the trek across the desert? Getting in late at night after shaking off marauders? Might be a carrier for the T-virus? Don’t know where the hell anything is, or where your friends ended up? Camp here. Figure it out later. A refugee camp of sorts for survivors of the apocalypse who are new to Wasteland, arrive late at night, or simply haven’t decided where to set up camp yet. And if your friends did get eaten by cannibals, just go make new friends. RV Blockade – Traversing the wastes in a house on wheels is neither fast nor glamorous, but it’s definitely a way to live in style. Safety in numbers to keep the marauders at bay. Silent Death – Step lightly, and be very very quiet. Some of the most vicious denizens of Wasteland dwell here. Best to respect them. Violators will be fed to the cannibals. The Ant Hill – A failed experiment in genetic manipulation, rumored to be a plot devised by the residents of Silent Death to create a buffer zone against invaders. Another rumor circulating is Wasteland Staff and volunteers have relocated all of the ant hills from H-park to this spot. Camp at your own peril. The Redoubt – Military units were the last hold-outs following orders and discipline, but it was only a matter of time before survival became the only order left. Some have just now climbed out of their bunkers, some have been trying to maintain order, while others have long gone rogue and banded together to survive. Old Town – Well versed in desert survival, this loose gathering of tribes knows how to raid fast, party hard, and live to tell about it. The last bastion of sin and vice in the Wastelands. Be warned. Late nights, and lots of noise. Nuclear Winter – The mushroom clouds on the horizon may have long since risen to the sky and left their blackened footprints where cities once stood, but the legacy of a radioactive Wasteland remains. Survivors of the nuclear apocalypse band together in the shadow of the Temple of Nuke, some as guardians, others for their own reasons. Rumor has it a few have begun a new religion, acting as monks and holy protectors of the sacred bomb. The Buzzard Patch – Venture into the wilds and test your strength against the elements. Those entering the Buzzard Patch should be prepared to face survivors of the Fury Road, carving out their niche in the rough terrain. RVs and Trailers are advised to stay out. Trespassers welcome. BE AWARE: 4WD ACESS RECOMMENDED, or walk in camping. If you drive your RV in here, you will get stuck. The Wilds – Home to the the most anti-social, non-interactive denizens of the Wastes. It’s here that people that generally don’t like other people camp together with other people who generally don’t like other people, make new friends, and get along fabulously. . . with other people. BE AWARE: 4WD ACESS RECOMMENDED, or walk in camping. If you drive your RV in here, you will get stuck. It’s Deathclaw mating season in the wilds. You don’t want to get stuck. Rolling Thunder – Have wheels, will roll. The sounds of engines vehicles burning the precious juice rumble for this loose alliance of Marauders and vehicle obsessed tribes. Every tribe gathered here is ready to roll with one or more themed post-apocalyptic vehicle at their disposal. There is nowhere to run. Quarantine Zone – Better have your gas mask and biohazard gear ready. Nobody is 100% immune to the viral apocalypse, whether it be germ warfare, blood-born plague, or your average corporate manufactured t-virus. These survivors come prepared not only to dig-in and outlive, but to take the fight to the infected. There are rumors that survivors, immune to the effects of bio-warfare, taking up residence in this area as well. Sanctuary – Just stretching your legs outside of a vault, or recruiting a gang of die-hard Wasteland raiders? This Fallout themed camping zone is the place for you! Please read through the (Theme Guidelines) and come prepared to submit your camp plan to the Sanctuary HOA. This zone is managed, and camping subject to approval. Gather with other Fallout fans in this loosely organized camping zone. There’s always another settlement out there that needs your help. Fiddler’s Green (NEW) – In the first years after the apocalypse, survivors fled the cities in semi-mobile travel boxes, cobbled together with whatever they could scavenge from the wastes. They discovered a flat patch of land, upwind from the radioactive storms, and settled this small colony. Half-Life (NEW) – This desolate patch of Wasteland is pot-marked with pockets of radiation leftover from the last great wars. Camp among the embers of the fallen world with those who live fast, ride hard, and hope to die historic on the Fury Road. Fort Kickass (NEW) – First boots on the ground, and the last to leave, staff and crew call this place home for weeks before and after the event. Last Hope (NEW) – Arriving later in the week once Wasteland has already started can make finding a camping spot difficult, but for some it’s the only option. This camping zone opens Friday evening, as the last chance for Wastelanders arriving after nightfall. Wandering around the event at night, searching for a campsite isn’t recommended, but we’ve all been there at one point in time. Find a camping spot, spend the night, see Wasteland with fresh eyes in the morning. Hades (New – Sort of) – Returning this year is a dedicated zone for fire spinners, performers, and those that enjoy being part of the show. Directly adjacent to the designated FIRE SPIN area, this loosely enforced camping area offers the opportunity to group up and perform in a safe, controlled environment.